Technology breakthrough: visualization of lentivirus genomes in living cells using ANCHOR technology. We are proud to announce that we obtain great results through a collaborative project with NeoVirTech, a company developing auto fluorescent virus for imaging and screening applications. GEG Tech has validated the auto-fluorescent ANCHOR tagging of lentiviral vectors (HIV-1 derived) for imaging and screening applications. Both integrating and non-integrating mutants can be visualized thanks to the ANCHOR technology, allowing the first-ever live tracking of lentiviral genomes, integrated or not, the observation of vector genome dynamics (video here) and the exact determination of copy number by cell (see illustration and legend). This new system allows the designing of innovative lentiviral vectors, and opens new ways for gene transfer tool users as well as for R&D in vectorology and virology. GEG Tech will make available this technology to its clients and will offer new services in order to exploit this powerful solution. GEG tech remains committed to its customers to design new gene transfer solutions and deliver breakthrough innovations. 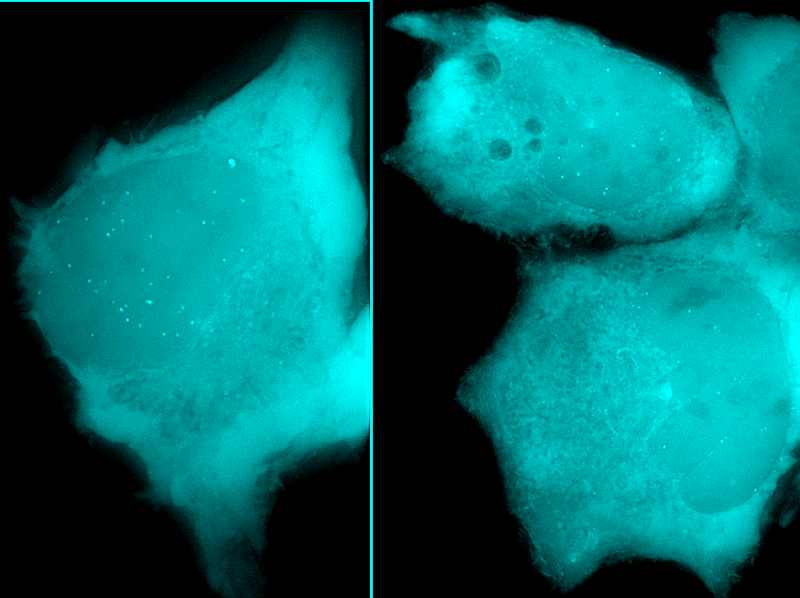 Images show transduced cells with ANCHOR HIV-1 derived lentivirus 24h PT (left) and 48hPT (right). Fluorescent spots correspond to the position of lentivirus genomes. For example, 44 vector genomes copies can be detected in the cell nucleus 24hPT.